The latest news, happenings and tips for your equipment from Ring Power Corporation. In these difficult economic times, not many companies are opening new facilities. However, to better serve our customers, Ring Power embarked on a long-term facility improvement plan in 2005, which has benefited every service area in our Florida sales territory. - 7,700-sq. ft. crane service facility expansion in Union City, Ga.
- The newest construction project, completed this summer, is the new facility located in Lakeland, which replaced the aging building in nearby Mulberry (see article on page 7 for details). Our investment in facility improvements is a testament to Ring Power’s long-term commitment to providing Ring Power customers the best product, parts and service and maintaining Ring Power’s standing as an industry leader well into the future. St. Augustine, FL; December 1, 2009 – For the eighth consecutive year, employees of Ring Power Corporation, north and central Florida's Caterpillar dealer, joined forces to bring holiday cheer to U.S. troops serving in Iraq and Afghanistan. This year, "Christmas for the Troops" netted 154 individual military APO/FPO flat rate boxes containing snacks, candies, toiletries, games, CDs, books, magazines and gun oil. According to Senior Accounting Clerk Dorothy Case, who spearheads the annual drive, "For those who are serving in harm’s way, those items are a real treat." 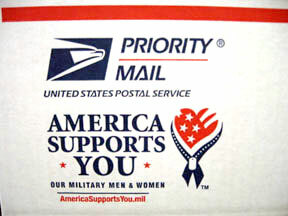 On November 19, the packages shipped out of the St. Augustine USPS branch to four military units with a special connection to the Ring Power "family:"
Sgt. Philip Wessels, son of VP/Entertainment Services Division GM Phil Wessels, received 15 care packages to share with his U.S. Army Special Forces unit deployed in Iraq. Marine Cpl. Kory Diley, son of Cat Rental Store Executive Secretary Nikki McDaniel, received 48 care packages for his Special Operations unit in Afghanistan. Sgt. Bobby Hendrix, brother of Soyna White, who works in the Credit Department, received 76 care packages for his Army National Guard unit, ARSIC-East Echo Company, serving in Afghanistan. Staff Sgt. Sean Wright, son of Cat Rental Store Administrative Assistant Sheryl Hand and Warranty Department Administrator Wendel Hand, received 15 care packages for his Army Special Forces unit, also deployed in Afghanistan. Ring Power Corporation, the Cat dealer for north and central Florida, is proud to support its employees’ loved ones, who so bravely serve our country. Ring Power Lift Trucks committed to first-class forklift support and service. As Director of Ring Power Lift Trucks, I want to send this personal message of thanks and assurance that our commitment to your complete satisfaction remains stronger than ever. I understand this has been a difficult year for all of our customers in the material handling industry. Our goal is to build an unprecedented level of customer satisfaction by being the "best-in-class" when providing you with forklifts and material handling equipment, forklift service and support. We will achieve this by creating a business culture in which knowledgeable, driven employees can thrive in today’s business climate. We clearly understand that the success of our business depends ultimately on the success of yours. As your business partner, we expect you to let us know ways we can improve our service to you, and when we get it right too. Please feel free to contact me or any Ring Power Lift Trucks employee with feedback or visit our website. We will be listening! On behalf of the entire Ring Power Lift Trucks division, I thank you for your loyalty and extend you our best wishes for a happy holiday season and a profitable 2010. 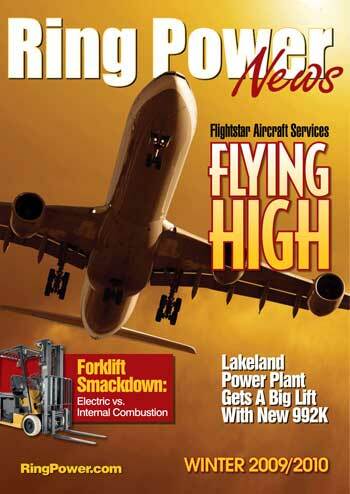 Ring Power Lift Trucks is the forklift division of Ring Power Corporation, headquartered in Jacksonville, Florida. Additional offices service Pompano Beach, Miami, Daytona Beach, Orlando, Sarasota, Tampa, Ocala and Tallahassee. Ring Power Lift Truck represents: Caterpillar® Lift Trucks, Mitsubishi Forklifts, Linde forklifts, Kalmar Industrial Forklifts and Container Handlers, Princeton and Navigator piggybacks, rough terrain forklifts by Noble, specialized products by Bendi and productive Cascade Attachments. Is Your Forklift’s Hydraulic System Protected? 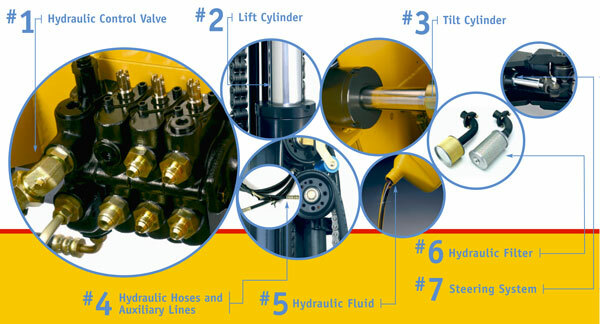 The hydraulic system of your forklift is the heart and lifeblood of your forklift. A forklift with a hydraulic contamination can result in extensive damage and extended forklift downtime – and downtime means less productivity and material handling moving. Use these tips from Ring Power Lift Trucks to keep your forklift healthy and operating smoothly. Incorrect hydraulic pressure can damage seals and restrict lift capacity. External leaks from the control valve and other sealed areas can contaminate the operating environment, accelerate component wear and reduce performance. Lift cylinder oil leaks could result in load drift problems and contamination of the operating environment. Low fluid can accelerate wear of a forklift’s hydraulic components. Leaks can occur externally or internally within the cylinder. Be watchful of hydraulic oil on the ground or on components. Tilt cylinder oil leaks could cause uncontrolled mast movement and contamination of the operating environment. Low fluid can accelerate wear of hydraulic components. Leaks can occur externally. Missing or damaged forklift hoses, tubes, lines and/or retainers could result in routing and interference problems. Bent or damaged hydraulic hose sheaves can damage the hoses. Both can result in oil leakage into the operating environment. Low fluid levels or heavy particles in the hydraulic oil can accelerate wear of the hydraulic pump and other hydraulic system components. Check the forklift’s hydraulic fluid reservoir and maintain proper levels. A forklift with a clogged suction strainer or return filter restricts oil flow, increases the forklift’s system pressure and accelerates wear of internal hydraulic components, all of which can lead to premature system failure. Leaking steering cylinders and/or hydraulic connections may contaminate the operating environment and result in loss of steering. Low fluid levels can accelerate hydraulic component wear. Ring Power Lift Trucks is the forklift division of Ring Power Corporation, headquartered in Jacksonville, Florida. 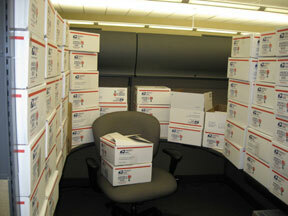 Additional offices service Pompano Beach, Miami, Daytona Beach, Orlando, Tampa, Ocala, Sarasota, and Tallahassee. 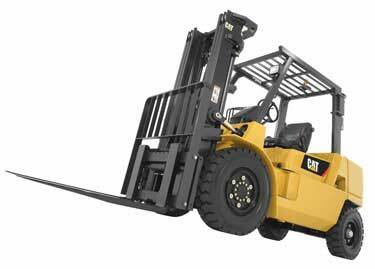 Ring Power Lift Truck services and repairs all makes of forklifts including Toyota, Hyster, Yale, Crown, Nissan and others. Click to schedule a service appointment. Ring Power Corporation will be well represented at the Seacargo Americas and Air Cargo America’s 2009 Exhibition held in Miami, Florida beginning November 4 and runs through November 6.
International trade representatives from the nearly all of Ring Power’s divisions will be available for customer interaction and to answer questions regarding forklifts and material handling equipment, industrial air compressors, generators, power plants, and heavy construction equipment, such as loaders, excavators, and tractors. Ring Power’s specialized divisions – heavy construction equipment, power generating systems, forklifts, crane, used Caterpillar parts – represents a wide variety of equipment and product lines for purchase, lease, or rental. We serve the heavy construction, road building, logging, agriculture, recycling, waste management and landfill maintenance, marine power, truck engine power, prime and standby power generation, entertainment venues, industrial power, warehousing, port container handling, material handling and many others. Email us for more information. Construction of the new Ring Power facility in Lakeland was completed right on schedule, consolidating Lakeland’s forklift operations and Mulberry’s heavy construction equipment and Cat Rental Store operations on an expansive 40-acre campus. Located less than two miles from exit 10 off Polk Parkway, the new facility at 3425 Reynolds Road offers 76,000 square feet of office, warehouse and service space. The service shops include seven heavy equipment service bays, six Cat Rental Store service bays, two forklift service bays and two bays for on-highway truck repair. "Building this new facility is a clear demonstration of Ring Power’s confidence in our customers’ futures as well as our own," said VP Lakeland Regional Sales Manager Mark Wineinger. "Our new location will enable us to penetrate new markets throughout Polk County, while we continue to expand and improve upon our services on behalf of our existing customers in the mining industry." Maintaining a watchful eye on your forklift’s engine performance is good business practice. It will also ensure your forklift is operating at peak performance, which in turn lowers your operating expenses and saves money. Below are seven areas to watch on your forklift’s engine system. Air Filtration Dirty or damaged air cleaner components, including the air cleaner hose, housing and seals, may allow unfiltered, contaminated air to enter the forklift’s engine and cause serious damage to rings, bearings and other components. Lubrication Oil breaks down chemically and accumulates contaminants over time regardless of the forklift’s engine hours. Heat cycles also break down additives in engine oil and deteriorate lubricating capabilities that can result in accelerated wear and shorter forklift engine life. Fuel System A forklift engine not tuned to optimal performance can result in low power, inefficient forklift operation and excessive fuel cost. Failure to comply with Environmental Protection Agency (EPA) requirements where applicable can result in considerable fines. Starting and Charging Stations Low forklift batteries, a loose alternator belt, damaged ignition components or worn or corroded electric forklift battery terminals could lead to poor performance, excess fuel usage, pollutants or a "no start" condition. 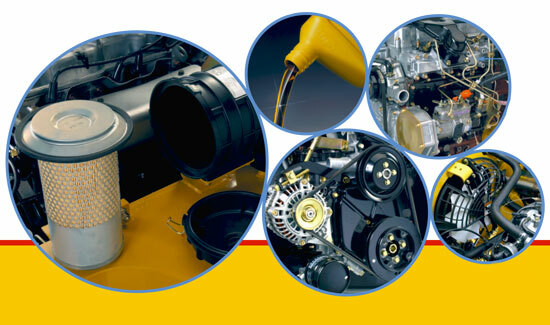 Cooling System Coolant also deteriorates over time, reducing the effectiveness of additives and changing the pH factor. Both can damage the forklift’s water pump, radiator and aluminum components. A damaged fan blade may cause vibration, which can damage the bearings and radiator. Seals & Gaskets A leaking valve cover and/or damaged pan gaskets or seals could contaminate the operating environment and result in costly forklift engine failure. Freeze Plugs Coolant leakage via freeze plugs could result in loss of fluid and overheating damage to the engine and transmission. Ring Power Lift Trucks make significant investments in professionally trained forklift service technicians, state-of-the-art diagnostic tools, completely stocked service vans and excellent parts inventory to help keep your forklifts on the job and being productive. In the long run, Ring Power Lift Trucks minimizes your risk and keeps your forklifts running at the lowest operating cost. 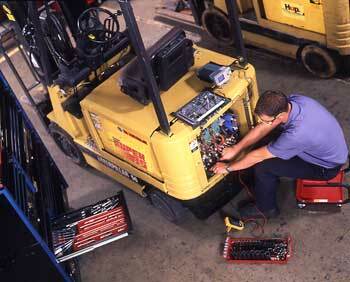 Call 1-877-544-5438, click or e-mail to have your forklift’s engine system checked, serviced, or repaired. Ring Power Lift Trucks is the forklift division of Ring Power Corporation, headquartered in Jacksonville, Florida. Additional offices service Pompano Beach, Miami, Daytona Beach, Orlando, Tampa, Ocala, Sarasota and Tallahassee. Ring Power Lift Truck represents: Caterpillar® Lift Trucks, Mitsubishi Forklifts, Linde forklifts, Kalmar Industrial Forklifts and Container Handlers, Princeton and Navigator piggybacks, rough terrain forklifts by Noble, specialized products by Bendi and productive Cascade Attachments. Mitsubishi Forklift Trucks is pleased to introduce a new series of AC powered light-duty walkie stackers* (PWF11 and PWT11) to complement the already impressive line of products for warehouse applications. These units replace the previous DC powered light-duty walkie stackers (PMWF11N and PMWT11N). Some key improvements include AC power, dual lift/lower controls, larger capacity battery and the addition of a crawl speed feature. Ring Power Lift Trucks is the material handling division of Ring Power Corporation, headquartered in Jacksonville, Florida. Additional offices service Pompano Beach, Miami, Daytona Beach, Orlando, Tampa, Ocala and Tallahassee. Ring Power Lift Trucks has parts for nearly any make forklift including Toyota, Hyster, Yale, Mitsubishi, Linde, Crown and many other models of forklifts. We also provide a guaranteed 4-hour response time on forklift service and forklift repair. Click to visit our website or email us for more information. The normal maximum percentage of elongation of a forklift’s lift chain is only 3%. Five Percent is the maximum edge wear allowed of a forklift’s lift chain. A forklift’s fork-length is only permitted to be extended by 1.5 times the length of the original fork. A forklift’s capacity is reduced by 20% when the fork’s wear is reduced by as little as 10%. Three most common failures of forks are cracked heels, worn heels, and unauthorized welds performed on the forks. Remember, "Repair by only the manufacturer of the fork or an expert of equal competence shall decide if a fork may be repaired for continual use, and the repairs shall be carried out by such parties. It is recommended that the surface cracks or wear be repaired by welding. When repairs necessitating resetting are required, the fork shall subsequently be subjected to an appropriate heat treatment, as necessary." Call 1-888-699-7811, click or email to have your forklift's forks inspected by a trained Ring Power Lift Trucks’ representative and ensure safe operation of your material handling equipment. Ring Power Lift Trucks is the material handling division of Ring Power Corporation, headquartered in Jacksonville, Florida. Additional offices service Pompano Beach, Miami, Daytona Beach, Orlando, Tampa, Ocala, Sarasota, St. Petersburg and Tallahassee. Ring Power Lift Trucks has parts for nearly any make forklift including Toyota, Hyster, Yale, Mitsubishi, Linde, Crown and many other models of forklifts. We also provide a guaranteed 4-hour response time on forklift service and forklift repair. Click to visit our website or email us for more information. New Fleet Pricing for forklift customers in warehousing, logistics, transporation, and others. Introducing new Mitsubishi Forklifts or Caterpillar Lift Trucks customer fleet pricing! Mitsubishi Caterpillar Forklift America (MCFA) is offering its dealers new customer fleet pricing and Ring Power Lift Trucks vows to pass this competitive forklift parts pricing strategy to our customers in transportation, logistics, agriculture packing houses, building contruction, warehousing and many others. If we don't share this opportunity with you, our customers, we will be doing a disservice to the people that have supported our company over the years. We urge you to check our pricing on OEM MCFA and MCFA's Promatch Parts. If you have not called recently, you may be costing your company a good opportunity to get an original quality part at a competitive price, not to mention the best warranty in the business. Click or e-mail us at rlinfo@ringpower.com for a quote and complete details. We’re interested in hearing your thoughts on forklift fleet maintenance – send an email and be heard. Ring Power Lift Trucks is the material handling division of Ring Power Corporation, headquartered in Jacksonville, Florida. Additional offices service Pompano Beach, Miami, Daytona Beach, Orlando, Tampa, Ocala and Tallahassee. Ring Power Lift Truck represents: Caterpillar® Lift Trucks, Mitsubishi Forklifts, Linde forklifts, Kalmar Industrial Forklifts, Princeton and Navigator piggybacks, rough terrain forklifts by Noble, and specialized products by Bendi, Big Joe and productive Cascade Attachments.